So Fashionably Frugal: Wrapping Up Winter: Colorfully! 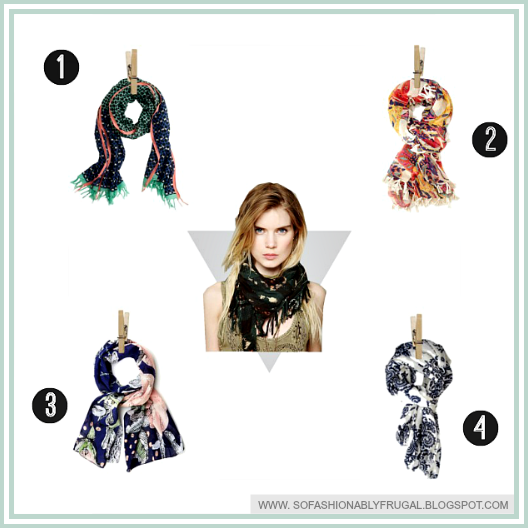 Today is about all about graphic prints...on scarves that is! They're my current fashion crush...all the bold colors and unique prints seem really ahead of trend. They also remind me a bit of Kate Spade? Plus, scarves are a great affordable way to update your wardrobe...especially when you need to save up for next semesters textbooks. Bleh. I actually got a graphic scarf from UO as a Christmas present and I love it to death. On my lazy days I wear an oversized cardigan, leggings and some flats and that scarf makes everything come together. Honestly guys, this is one of the best comfy outfits I can recommend to you. Try it out sometime! I swear you don't look like you actually took 2 minutes to get dressed. I'm curious now..what are some of your favorite cozy outfits?? Let's share!